From Art Linkletter to Sgraffito, it's all here. As usual, this Newsletter is too long and, especially with this issue, very image heavy. There is just so much beautiful work out there and I wanted to share it with you. It makes me so excited to see beautiful art: my breath catches, my heart pounds, I make odd, unexpected, embarrassing squeals - like I've received the most perfect gift in the world - which I have. Enjoy! My very silly trailer of the studio move: Nancy LT Hamilton, Lou the Cat and Rigo Move the Studio. I've been told that I held the phone the wrong way (as some have pointed out) . Didn't know there was a rule. Sorry. Hey, I just learned how to text this year! Took me 6 months to find my voice mail. Drives my son and (obviously) others crazy. Sorry for the lack of videos recently. Between vacations, the move and Burning Man (Lisa, my videographer went), there wasn't a lot of time. Busy summer! 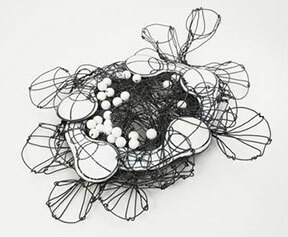 Pictures of "Newish Work" That, unfortunately, is not enameled! 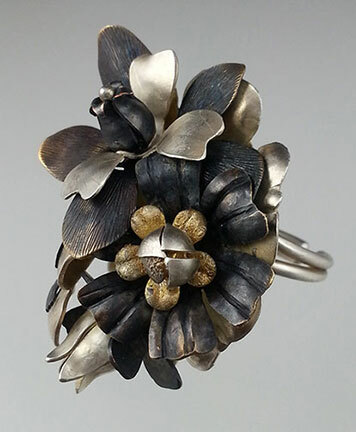 Floral Bouquet Ring: Sterling, Brass, Bronze, Copper, Fine Silver, Argentium Silver. Lots of Chasing and Repousse. The copper used is darkened with Liver of Sulphur. 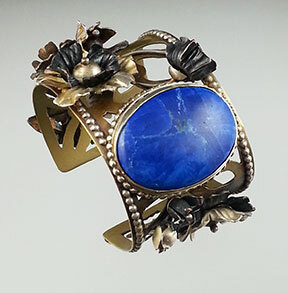 Flower Cuff: Brass, Bronze, Sterling, Fine Silver, Argentium Silver, Copper, Dyed Howlite. More chasing and repousse and a bunch of piercing with the saw too! Just finished teaching at Art Is You in Petaluma. I had the most amazing class!!! But, boy, my back hated it. I think I brought half of my studio with me and it's a pretty heavy studio. Obsessive, perhaps...compulsive, I'm starting to think so. Thanks to the 9 students in my class: you were truly fabulous. 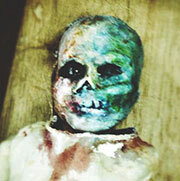 We used a ton of acrylic washes, Aves Apoxie Clay, Dap Kwik Seal (yep, tub and tile adhesive for texturing) and dolls, that we mutilated. I love sculpting and painting so, the class hit the spot. As usual, the buffet lunch at the Sheraton in Petaluma, CA, was amazing. Sallianne and Ellen, of Art is You, did a great job with this year's event - as usual. In summary: Made a few new friends, saw a few old ones and met some of my viewers. Made art, helped others create something that they didn't know they could and enjoyed myself. I've finally recovered from all that fun! Over the years (since the 13th century), humans have come up with many interesting ways to alter/embellish/ornament metal with glass. One of the techniques that our ancestors developed was enameling. Our great, great, great, perhaps, not-so-great, "grandpappies" and "grandmammies" also came up with a plethora of ways to apply that glass to metal. Some of their inventions, you may have already heard of: Champlevé, Cloisonné, Basse Taille, Grisaille, Limoge, and Plique-á-Jour. The ideas kept coming: water color enamels, enamel marking pens, enamel crayons or pencils, enamel decals (see below for links), liquid enamel, acrylic enamel, screen printing and luster decals. Are there lots and lots of ideas floating around your head right now? Or are you wondering if your ancestors had something to do with this enameling thing? Well, obviously, there is much to do (and for me to talk about) so, we shan't worry about them just now. Enameling Now and Then by Karen L. Cohen at Ganoksin, provides a, seemingly endless list of enameling techniques for you to research and learn! It makes me tired just thinking about the amount of techniques that I've yet to try! Did you know, that you can make your own decals or have them made for you. Further down in the Newsletter are links on this subject - if you are still awake. Have you heard of Sgraffito? It's a process where you scratch through one layer of enamel to reveal another layer (or color) beneath. Graffiti and Sgraffito are very related in their origins. The origin of the word is from the Greek "graphein". Translation: to write. Ever seen this guy? This is Kilroy and he's been a graffiti phenom since World War II. Wonder if he can enamel? You could sgraffito him. Just an idea. So many different effects can be achieved with Sgraffito. Here's a tutorial from Copperheart Enameling to give you an idea of how the process works. Another from Tom Ellis at Ganoksin. 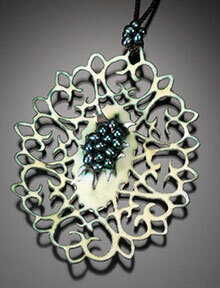 Video: Sgraffito - Method 1 of 4 by Art Jewelry Magazine. There are more places to visit and more information to glean, further on, in the newsletter. Schlaifer's Enameling Supplies - Great Service! In Plain Sight Art, custom decals. 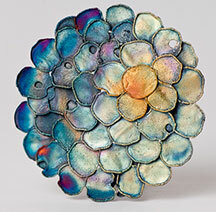 500 Enameled Objects: A Celebration of Color on Metal by Lark Books - not a "skills" book but one of inspirations. Enameling on Metal: The Art and Craft of Enameling on Metal Explained Clearly and Precisely by Nuria Lopez-Ribalta, Eva Pascual i Miro. by Jill Hermans: Took my breath away when I saw this! 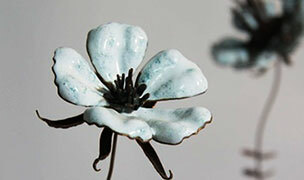 Enameling Made Easy: Torch-Firing Workshop for Beginners and Beyond. Book and DVD by Anat Silvera. $24.99 at Rio Grande. At Amazon: $15.72 (Prime). 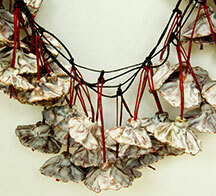 Explorations in Jewelry Enameling: Torch and Kiln Techniques with Susan Lenart Kazmer - DVD - $24.95 and 2 types of download $10.98 to $12.48 US at Interweave Store. ArtStop Cloisonné - San Diego Museum of Art on Chinese and Japanese Cloisonné. Very interesting. Cloisonné Enamel from Start to Finish with Ricky Frank produced by Rio Grande. Enameling Roller-Printed Metal Part 1, Part 2 with Ricky Frank produced by Rio Grande (basically the Basse Taille technique). Creating a Domed Red Enamel Component with Ricky Frank produced by Rio Grande (basic enameling). Using Adhesive Techniques On Deeply Fold-Formed Metal with Ricky Frank produced by Rio Grande. 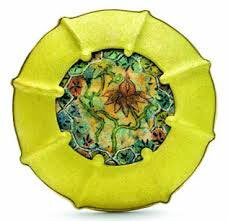 Enameling on Fold-Formed Metal with Ricky Frank produced by Rio Grande. Enameling on PMC (metal clay) and Fine Silver with Ricky Frank produced by Rio Grande. Articles by Enamelwork Supply, Inc. Making Fired Enamel Samples, Working with Foil and Leaf, Introduction to Enameling, Enameling 101 for Metal Clay Artists, etc. 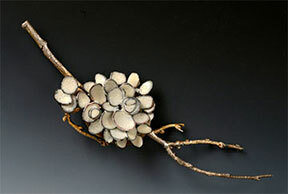 Enameling on Rio Grande's Blog: The Studio. Lots of information on enameling. Experimental Techniques for CareFree Lusters by Harry McDaniel from Glass on Metal Magazine 1994. Cloisonne Primer (The) History of Cloisonne Technique by Woodrow Carpenter at Ganoksin. Overview of Metal Preparation by Woodrow W. Carpenter, Glass on Metal Magazine, January 1982. Painting Enamels on Galina Selezneva's enamel painting technique from Glass on Metal 1992. 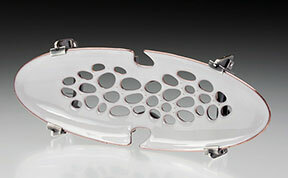 SES FAQS - Information on starting out in enameling, which white to pick, liquid enamels, etc. Troubleshooting by Enamelwork Supply, Inc. Black spots, bubbles and pits, color changes, melted wires, pulling away, reddish transparents and warping. Sounds like fun! 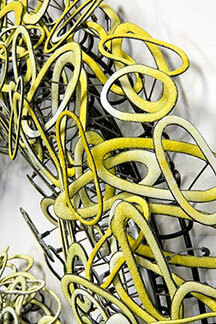 European Guilds - Courtesy of Grains of Glass: An Open Studio for Enamel Artists Worldwide. Argentina, Australia, Belgium, Brazil, Canada, France, Republic of Georgia: Courtesy of Glass on Metal. 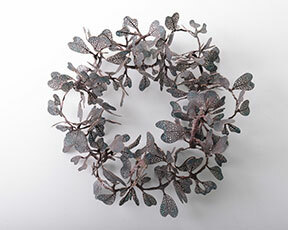 ***Safety notes when working with enamels: wear a N95 particulate mask when sifting and mixing enamels. Wear UV protective glasses when using a kiln or torch. Protect against developing cataracts! I wish I had used them earlier in my career. Probably wouldn't be having cataract surgery soon!!!! When working with leaded enamels, extra precautions are required. 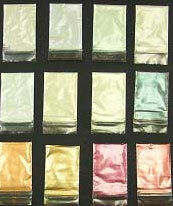 Enamelwork Supply Company has information on working safely with leaded enamel. I would add one further note: keep pets out of the studio when working with this type of enamel. Actually, if you use leaded enamels, it would be best if they stayed out forever. Should start calling this newsletter: the Linkletter. "The Art Linkletter". You old folks, like me, will see through my little pun and while you youngsters argue about what is wrong with my brain, we'll be sittin' back, a rockin' in our chairs and thinking: those "Kids say the darndest things!" Copyright © *|2014|* *|Nancy LT Hamilton Jewelry, All rights reserved.